The General Statistics Office of Vietnam (GSO) recently released the 2017 Economic Census, which includes information about economic establishments, business activities, labor market, and outsourcing activities. It covers State and non-state domestic enterprises as well as foreign-invested enterprises (FIEs). According to the census, as of April 2017, there were 517,900 businesses operating in Vietnam, up 51.6 percent compared to the 2012 census. However, large companies accounted for only 1.9 percent of the total. Currently, there are only 10,000 large firms, up 29.6 percent compared to 2012. The majority (98.1 percent) of the firms continue to be small, medium, and micro-enterprise, which grew by 52.1 percent compared to 2012 to 507,860. Southeast Vietnam accounted for 216,000 businesses, 41.7 percent of the total number of companies in the country. The region attracted 5.3 million workers, 37.7 percent of the total labor force. Red River Delta, which ranks second with 161,000 firms, accounted for 31.1 percent of the total number of businesses and 32.5 percent of the total number of employees. The Central Highlands accounted for only 2.6 percent of the total number of enterprises, the lowest in the country. Net revenue in 2016 increased by 71 percent higher compared to 2011 to VND 17,858 trillion (USD765.1 billion). Highest earnings were recorded in the non-State businesses, accounting for 55.9 percent of the total net revenue. However, the highest growth was witnessed in the FDI sector, which grew by 134.5 percent in 2016 compared to 2011. State-owned enterprises (SOEs) recorded the lowest contribution to the net revenues between 2011 and 2016. In 2016, FDI firms had the highest return on assets (ROA) at 6.9 percent, followed by SOEs and non-State companies at 2.6 and 1.4 percent respectively. Sector-wise, the industrial and construction sector had the highest ROA in 2016 at 4.8 percent, followed by the agriculture, fishery and forestry sector at two percent. The ROA for the services sector was 1.6 percent in 2016. The number of SMEs between 2012 and 2017 grew rapidly, however, the number of employees in larger enterprises grew faster compared to SMEs. Between 2012 and 2017, the number of SMEs grew by 8.8 percent, faster than the number of large enterprises which grew by 5.3 percent. Labor force in large enterprises grew by 33.8 percent, while in SMEs, the growth was only 22.1 percent. The number of SOEs and employees between 2012 and 2017 decreased by 18.4 percent and 23.1 percent respectively. In 2017, the number of FDI firms and employees witnessed the highest growth compared to state and non-state entities at 54 percent and 62.8 percent respectively compared to 2012. The number of non-state enterprises and employees grew by 52.3 percent and 27.9 percent respectively, second only to FDI firms. According to the economic census, the industry and construction sector contributes the most to the government’s budget, while the services sector which accounts for the highest number of firms, is growing the fastest. As of 2017, the number of firms in the services sector grew by 57.1 percent, compared to 2012, while the labor force grew by 31.5 percent. In the wholesale, retail and repair sector, the number of enterprises grew by 51.6 percent, while the labor force grew by 24.5 percent. The number of companies involved in the scientific and technology sector expanded by 59.8 percent, while employees in the sector grew by 24.6 percent. Employees in the production and distribution of electricity, gas, hot water, steam, and air conditioning sector grew by 33.3 percent, while the number of firms expanded by 25.3 percent. Workers involved in the agriculture sector declined by 0.4 percent, while the number of firms grew by 27.5 percent. The government conducted a survey of 3,500 enterprises in the manufacturing and processing sector that covered the impact of trade agreements, relations with foreign partners, and feedback for the government. Around 95 percent of the surveyed firms were knowledgeable about the existing and upcoming free trade agreements and 83.9 percent of the companies supported the country’s participation in FTAs. Enterprises stay updated about the FTAs through information channels such as media, industry associations, and state management agencies. With respect to the impact of foreign business partners, 42.1 percent of the surveyed firms were most optimistic about East Asia and Pacific partners, closely followed by the US at 42 percent. Businesses who were optimistic about Southeast Asian and European partners accounted for 35 percent, while only 23.6 percent of the firms were in favor of Chinese partners. 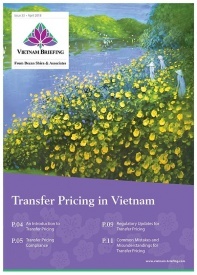 The feedback for the government with respect to FTAs focused on administrative procedures, market information, and details about the agreement. More than 84 percent of the firms wanted the government to simplify the procedures, while 69.4 percent wanted detailed information about the trade agreements. Over half of the surveyed businesses would like the government to provide information on foreign markets, while 48.9 percent would like information on domestic markets. 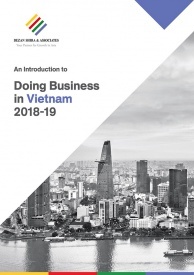 The 2017 Economic Census is the first census that includes the revenue generated by Vietnamese firms from outsourcing goods for foreign manufacturers. In 2016, there were 1,740 enterprises involved in outsourcing activities with revenues amounting to US$8.6 billion. Out of the total, 1,687 firms provided outsourcing services, while 52 firms sent materials to foreign businesses for processing. Major products in the outsourcing industry include textiles, footwear, telephones and components, computers, and electronic devices. Textile and footwear sector accounted for 48 percent of the total outsourcing revenue, while footwear accounted for 32 percent. Assembly of electronics devices accounted only for 0.7 percent. Imports related to outsourcing activities reached US$20.2 billion, with FIEs accounting for 80.7 percent of the total import value. Export value of processed goods reached US$32.4 billion, with FIEs accounting for 79 percent of the total. South Korea, Taiwan, China, the US, and Japan were the major outsourcing partners for Vietnam. In 2017, the labor force below the age of 30 accounted for 35.2 percent of the total labor force, while laborers between 31 and 45 were the majority at 42.7 percent. In the enterprise sector, the labor force between the ages of 16 and 30 accounted for the largest share, while in the administrative units, laborers between 31 and 45 were in majority. The share of unskilled labor to the total number of employees in economic, administrative, and religious units decreased from 34.7 percent in 2012 to 29.7 percent in 2017. University educated labor force grew from 17.9 percent to 18.4 percent during the same period. Between 2012-17, the share of the college-educated labor force increased from 4.9 percent to 6.7 percent, while the share of workers with primary education increased from 6.8 percent to 8.8 percent. In the corporate sector, the percentage share of employees with a university education or higher was more than 50 percent. The demand for high-skilled labor is highest in the finance, banking, insurance, information and communication, and education sectors. The Economic Census highlights the importance of FDI in the Vietnamese economy. FIEs continue to grow faster compared to SOEs and non-State entities in all areas such as labor, revenue, exports, and the number of establishments. In addition to the FDI sector, the government needs to focus on the domestic sector. It needs to accelerate the divestments of SOEs and increase support for domestic entities in areas such as labor quality, access to capital, higher value-added activities, and boosting linkages with foreign companies.